Registrations for Jio GigaFiber high-speed broadband are now officially open, allowing you to show your interest in the service. Jio GigaFiber was announced last month, and will provide speeds to 1Gbps, according to the company. For now, users can only register their interest for the Jio broadband service; the company will give priority to areas with the highest interest for the rollout. 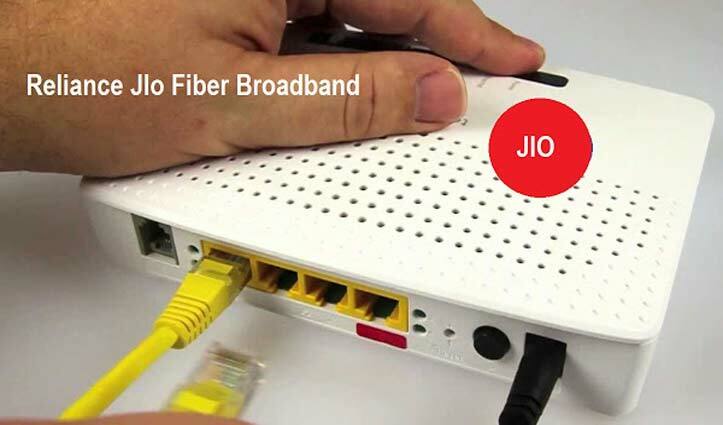 RIL Chairman Mukesh Ambani had said last month that Jio GigaFiber will be launched in 1,100 cities across the country, but there is no date yet for the official rollout. The Jio broadband service had been in testing for the past couple of years, with users reporting download speeds of over 700Mbps. 2. Here, enter your address by pressing the Change button. After you enter your address and hit the Submit button, the screen will still show the default address. Nonetheless, select whether the address you have entered is your home or work address. 5. That’s it, you are done with Jio GigaFiber registrations and have expressed for interest in your area. You can also nominate other areas for the Jio broadband service, such as parents’ address, work address, etc. You do not need to pay any sum while registering. 6. Jio GigaFiber will provide “wall-to-wall high-speed Wi-Fi coverage” and also power’s the company’s GigaTV and Smart Home solutions. For setting up the Jio GigaFiber network, the company will install a Jio GigaRouter at your home or office. The company says users will be able to stream 4K videos and play VR games on the network. It is not yet clear how many devices will be supported on the network at the same time. 7. The broadband network will also power the TV experience and the smart home suite. For large screen TVs, the company will install the GigaTV set-top box and provide a voice-activated remote to users. Consumers will be able to watch “600+ TV channels, thousands of movies, millions of songs, and any other type of content possible” with this set-top box the company says. The presentation showed apps such as JioTV, JioCinema, JioTVCall, JioSmartLiving, JioNetVelocity, JioCloud, MediaShare, and JioStore on a TV screen. 8. The bundled JioRemote will be able to take voice commands — users only need to speak aloud what they want to watch on TV and it will play the same “immediately on your TV.” It will work with multiple Indian languages, the company says, though it did not say which languages will be support. 9. 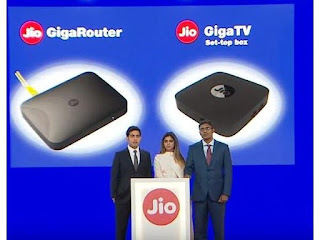 Users will also be able to make video calls on TVs powered by Jio GigaFiber — video calls will be supported on other TVs using a Jio network, along with mobile phones and tablets on any network. 10. The Jio broadband network will also be at the heart of its smart home suite, which includes accessories such as audio dongle, video dongle, smart speaker, Wi-Fi extender, smart plug, outdoor security camera and TV camera, among others. Users will be able to monitor and control their GigaFiber-connected homes using a smartphone, including the temperature, lighting, gas, and water leakages. The company claims it will take just an hour to set up the smart home. 12. Will Jio Phone 2 help WhatsApp, YouTube reach the next billion users in India? We discussed that on Orbital, our weekly technology podcast, which you can subscribe to via Apple Podcasts or RSS, download theepisode, or just hit the play button below.